You are holding a pure artisan craft ale, free of any additives. This is a real ale. Unfiltered and unpasteurized, so a small amount of sediment in the bottom of the bottle is natural. South Plains RIP is made with North American hops to balance the huge amounts of English malts that give this dark ale it’s complex and generous flavor. Imperial Porter is a style that is higher in alcohol, bearing more flavor than traditional porters. Store this beer in a cool, dark place. When it’s young it’s very heartwarming. As it ages it will get smoother and smoother. Dark brown color. Roasted aromas, coffee and hops. Chocolate taste, roasted, slight bitter coffe. Roasted finish. Svart med fingerhøyt lys brunt skum. Lukter halslinser, mest søtlige lukter, mørke bær, bjørnebær, gummigodis, sjokolade og lett kaffe. Smaker søt kaffemokka, noe salt lakris og bær. Middels pluss i fylde. Noe kakaopulver. Salt lakris dominerer utover. Bottle: Thanks Hackobock: Served in a Chouffe glass: Black beer with a small creamy head. Aroma is an exciting and quite a different one than usual: bay leaf, coal, prunes, some brown sugary tints, some alcohol and roast... Flavour is bitter and spice with coal, bay leaf, liquorice, light roast, some prunes, flowers and wood/coffee roast Aftertaste is bitter, coal, roast, bay leaf and something crispy herbal... Low carbo, water mouthfeel, tiny bit more than medium bodied. Strange but absolutely decent! Flaska från SB. Av bäst före-datumet att döma gissar jag att flaskan är drygt ett år gammal, även om jag köpte den från SB idag. Tjusigt bäcksvart i färgen. Knappt något skum alls, till skillnad mot vad de flesta andra skriver här. Doften är sötsyrlig med mörk choklad, kakao, kaffe, soja, rågbröd, pumpernickel, toffee, molass. Även något söta toner av torkad frukt. En tydlig dragning åt det sötsura/syrliga håller snarare än torrare kaffebeska. Kroppen är fyllig, men tunnas ut något i munnen. Alkoholen märkbar, men tar inte över. Smaken drar iväg än mer åt det syrliga hållet. Syrligt äpple, syrliga bär och citron. De något mer matta och lena kaffe- och kakao-tonerna med medföljande beska håller sig i bakgrunden. Ju mer jag dricker av den, desto mer övertygad blir jag att det är en sur-stout, med näst intill vinösa toner. Lite udda, och spretar tyvärr för mycket enligt min smak. De syrliga tonerna håller inte riktigt ihop med de tyngre och mörkare tonerna av kakao och kaffe. Hade gärna gett ett större utrymme åt de sistnämnda, som i sig är väldigt fina. Felsmak, eller bara en väldigt udda porter? Flaska. Först började jag hälla upp i ett glas, skummade över. Eftersom det fortsatte att skumma upp ur flaskan var det bara att ta fram ett glas till. Vänta i cirka 15 minuter. Sen gick det att dricka. Värdelöst. Och en hel del skum hamnade ändå på bänken, trots mina bägge glas. Som sagt, värdelöst. Dofter och smaker ändå bra, med sojasås, kaffe och rostad malt som mest framträdande. Torr avslutning. Bottle. Black color with tan foam. Aroma and taste: coffee, wine, roasted, licorice and dried fruits, good one. Foam is quite tremendous in this Imperial Porter from the Swedish brewery South Plains. Thick and nougat colored foam is a tremendous damper for flavor, but a little sharp tones coffee break anyway through the foam layer. The beer is thick, almost oily, but release a strong taste of good coffee and light tones of dark bitter chocolate. 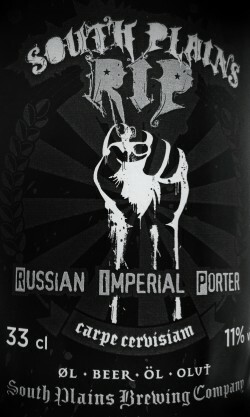 It is a powerful porter with very high volume and filling pleasant taste of dark rye bread. This is not a porter who I would recommend to beer drinkers who not normally like porter. It is a powerful and aggressive porter who offers everything a real porter fan is seeking. The coffee is the main theme, chocolate and some licorice follows in the background. It is definitely a porter who is among the fiercest I have so far tasted. I seems to like the strong and almost chewable stouts / porters, but I must admit that I love it. From tap at KØ 15. Black with a beige head. Aroma and flavour of roasted malt, chocolate, coffee, licorice, caramel and alcohol.